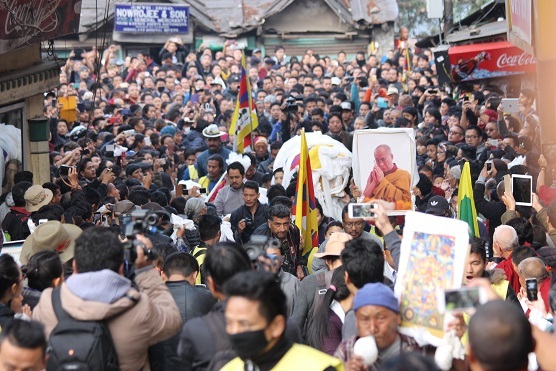 (TibetanReview.net, Mar08’16) – Thousands of Tibetans, joined by supporters, took part in an emotionally charged funeral ceremony at Dharamshala, India, on Mar 6 of 16-year-old schoolboy Dorje Tsering who had self-immolated on Feb 29. The boy had said as he lay dying in Safdarjang Hospital in New Delhi that he had made a human butter lamp offering of himself in order to shock and draw global attention to the plight of Tibet under China’s occupation rule. The Class X boy of the Tibetan Homes Foundation school, near Deharun in Uttarkhand state, had succumbed to 98% burn injuries on Mar 3, according to hospital official Pankaj quoted by the AP on Mar 4. The mourners, many in tears, gathered at the Lhagyal-Ri public incense-leaf burning ceremony site where the body was brought in a casket covered with a flag each of the Tibetan nation and the Tibetan Youth Congress (TYC), which organized the ceremony. The Tibetan national anthem was sung, following by offering of prayers. Thupten Tashi, the boy’s 69-year-old father, addressed the crowd in pauses, recounting how the tragic self-immolation incident had taken place and thanking everyone who had helped and shown solidarity with his family during this difficult time. TYC President Tenzin Jigme and Vice-President Tamding Hrichoe also spoke, condemning the UN and foreign governments for showing little or no concern for Tibet’s tragic plight under China’s occupation rule and calling on Tibetan to be more pro-active towards their national cause. The body was later carried in procession to the crematorium, located about a couple of kilometers or so away, with chanting of prayers. The boy’s father has said he had wanted to give some words of advice to his son as he was headed back to his school during a visit to relatives at the Tibetan old people’s home in Herbertpur, near Dehradun. He went to look for him outside, only to see a person in a ball of fire and his elder daughter frantically shouting, “its Dorjee, please stop him!” Mother Nyima Yangkyi, 59, dragged him under a nearby tap to put out the flames. But it was too late and she herself suffered burns on both her hands. The boy’s mother has appreciated all the words of condolences, attention and help her family has received from people across the world. Having previously rebuked her son for expressing an intention to carry out the kind of action that he now had, she felt that Dorje had not wasted his life. However, she wanted other Tibetan youths not to follow his path but to live to fight for Tibet. The father has also urged young Tibetans not to self-immolate. Rather, he wanted them to fulfil His Holiness the Dalai Lama’s wishes and contribute to the struggle through education.